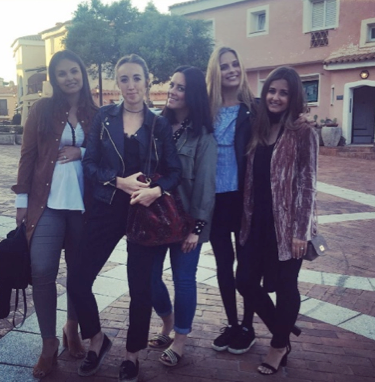 This week our founder, Holly Scarsella, takes you behind the scenes of our most recent photoshoot in Sardinia. The PAMPELONE shoot team spent 4 days on the stunning Costa Smeralda at the Hotel Cervo shooting the Resort 17 and SS18 collections. Are you ready for a sneak peak at the brand new pieces? Holly at the Hotel Cervo, ready for the shoot wearing brand new SS18 piece (launching early 2018), and also a 6 month baby bump! On the first day of our shoots, the first thing we do is location scouting. In advance of the trip, our Photographer Harley Kemp and I have already done sone research on areas in the local area that could work for the shoot. We spend the morning scouting each location and checking for light, how busy the area is etc and also take a walk to see if there are any further areas that could work. They key thing for us is to get a great mixture of beach shots and town shots that exude the Riviera lifestyle which the PAMPELONE brand is based on. One of the cutest doorways we found in a little village on top of a hill! It was just too pretty not to shoot against. We decided thats hooting a white dress would be perfect here against the blue! The idyllic town of Porto Cervo. The Resort and SS18 collections were inspired by the Italian island of Sardegna. When I was designing the collection I had the beauty of Porto Cervo in mind, the charm of the old fishing villages, and the emerald hues of the Costa Smeralda. Having never been to Sardinia before, I was completely blown away by the colour of the coastline. Our Make Up Artist Extraordinaire Jo Hamilton adding a soft blush lip. The finished product – such a bombshell. Being 6 months pregnant on the shoot made me really apprehensive but with such an incredible team, I managed to direct the majority of the shoot sat in the sun and sat on a lounger or deck. Photoshoots are one of the funnest and most important parts of my job – it’s where we get to really present the newest collections, so I was never going to sit it out! Directing the shoot from a great location! In Sardinia, we stayed at the Hotel Cervo in the heart of Porto Cervo and on the perfect emerald water. It has a reputation as one of the leading hotels in the world and having stayed there I can totally see why. From the stunning courtyard which the rooms connect to, to the traditional white washed walls, we just loved it. So much so in fact, that for the first time ever we decided to actually shoot some of the looks in the hotel itself, and even captured one of my favourite shots ever (below) of our beautiful model Cecelia and the funniest Italian waiter! For more information on the hotel, please see links at the bottom of the blog post.